The quality of hot rolled products is largely determined by the performance of the emulsion for cooling and lubrication. From the perspective of emulsion preparation, daily management, maintenance and disposal of waste emulsions, how to manage and maintain the emulsion system is explained. The main processing equipment of aluminum strip is the splitter group, which can be divided into the required length and width according to the need. Of course, the equipment used to process the strips is in general use, and the copper coil can also be processed. The product processed is called copper strip. In the production process, aluminum strips are prone to casting defects such as shrinkage cavities, blisters, pores and slag inclusions,strict control of the whole process of melting and casting plays an important role in preventing casting defects such as pinhole, inclusion, undercast, crack, porosity and shrinkage. As long as the aluminum strip extruding tube is used in the whole aluminum can body, because of the high hydrogen absorption tendency of aluminum melt, strong oxidation ability and easy dissolution of iron, simple and careful preventive measures must be taken in the process of melting and casting in order to obtain high quality castings. 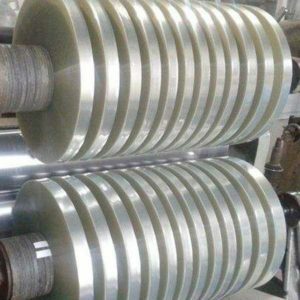 Chemical production and storage equipment, cold-worked bars, cold-worked wire, rivet wire, forgings, foils, heat sinks are mainly used for processing parts that require good forming properties, high corrosion resistance, or good weldability. Good formability, corrosion resistance, candle resistance, fatigue strength and moderate static strength.